A Bunion is a common problem that most people experience as a bony protuberance at the base of the big toe. The problem, however, is more complicated than simply a bump. Bunions are most commonly due to the big toe angling in towards the other toes, a condition called hallux valgus. Toe deformity - a drifting in of your big toe toward the small toes. Toe stiffness - inability to bend and straighten your toe. There are several different operations for correcting bunions. 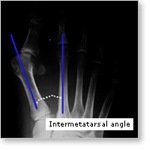 Fitter Feet Surgeons use modern techniques to re-align the abnormal positions of the metatarsal bone and the phalanx bones in the big toe. The newly aligned bones are held in place with screws and K-wires so the correction is maintained. This allows faster recovery from surgery and in most cases there is no need for a cast. Scarf Osteotomy — The Scarf osteotomy technique is a well proven surgical method that has been used for many years. It establishes a long-term correction of the defective position of the skeleton while at the same time, because of its three dimensional philosophy, helps reduce the problem of a splayed wide foot. A patient will have a short hospital stay after undergoing the 45 minute operation. Only in exceptional cases is a patient treated as an in-patient. It is possible to do the corrective surgery on both feet at the same time if the patient wishes. Other surgery performed at Fitter Feet to correct Hallux valgus, include Austin Ostetomies, Lapidus Fusion and opening and closing base wedge ostetomies. The selection of procedure depends on how large the bunion is, and how high the angle is between the 1st and 2nd Metatarsals.